AgriTraxx Midrollers have up to four times more work life than most OEM replacement wheels. AgriTraxx Midrollers are owner operator’s #1 choice for rubber tracked equipment and come with an industry-exclusive No Bond Failure Guarantee. AgriTraxx Midrollers extend rubber track life by lowering the operating temperature and eliminating debris entrapment. 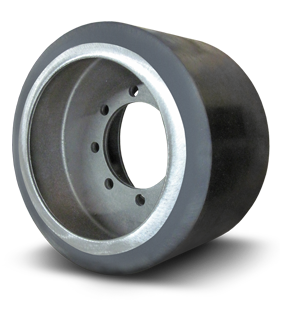 The Best Bogie and Idler Wheels in the Industry. Polyurethane compound engineered to generate less heat, reduce chunking and provide the highest cut and tear resistance. Proprietary bonding technology that resists heat and shear force to prevent debonding. Lower operating temperatures reduce rubber track deterioration. Tough polyurethane will not capture debris and score the track. Unlike rubber, AgriTraxx Midrollers polyurethane is resistant to oils, UV, weak acids, diesel fuel, moisture and more. Tested on the same tractor, pulling dual pan scrapers. 347 hours - Visible excessive damage and uneven wear. Wheels have to be replaced to prevent further track damage. 117.0 - The highest temperature reached. This lower temperature extends both rubber track and wheel wear-life. 161.1 - The highest temperature reached during the same usage interval as AgriTraxx Midrollers. Agricultural and construction applications that require continuous operation handling heavy loads, high speeds and the towing of heavy implements such as pan scrapers. AgriTraxx Midrollers hold up in the most extreme operating conditions and provide the longest work-life, significantly reducing downtime. Available for most popular equipment makes.